Unexpected good surprises, are the highlights of my days in Blogland. 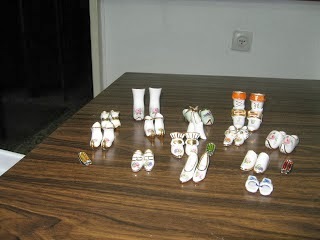 This time, a parcel arrived from Kikka, containing miniature shoes for my collection. Last year, in a swap between us, I sent Kikka, a miniature pair of replica precolombian frog earrings for her miniature frogs collections. Kikka, being such a lovely lady, remembered to look out for miniature shoes and these are the beautiful items she found and sent me. and wonderful, yummy candies which sadly vanished away too quickly. 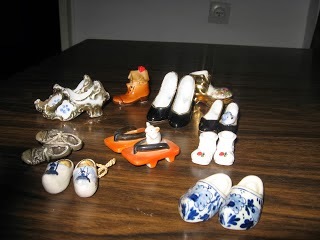 For readers who have missed my post about the miniature shoe collection, here are two photos, a small part of the collection. 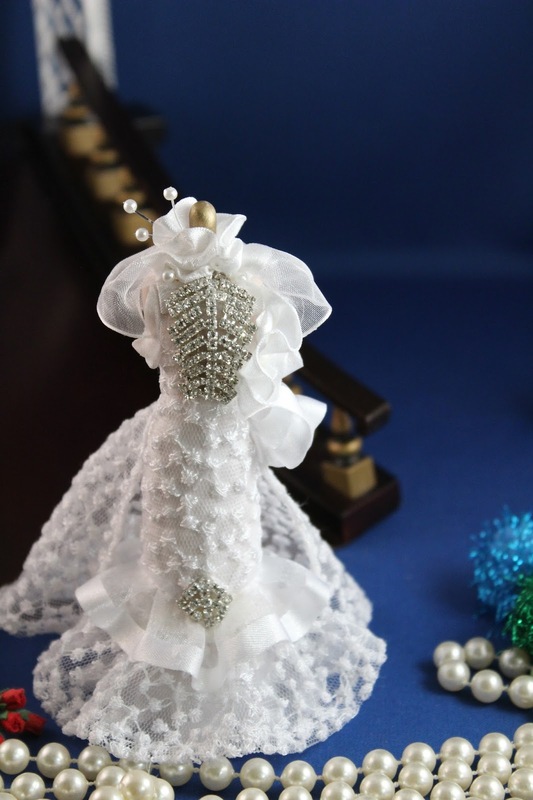 They are miniatures, but larger than dollhouse size. THANK YOU KIKKA FOR YOUR GENEROSITY. YOUR GIFTS HAVE ARRIVED IN TIME TO BE MY FIRST HANUKKAH GIFTS. Hello Drora wonderful gifts from Kikka! Kiss! Beautiful gifts for your great collection. Wonderful gifts from Kikka. I love the reindeer shoes. Your collection of shoes is fantastic. Congratulations on your gift from Kikka, Droara, it is so sweet of her to sent you these mini shoes, love the booties from Lapland! You already have a fantastic shoe collection! Que bonitos regalos, me encantan los zapatitos. 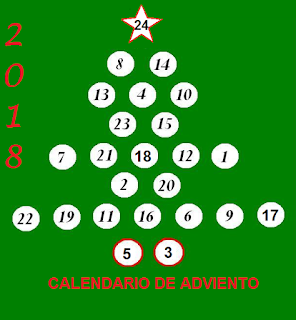 Que regalo tan bonito y además inesperado!!!! Tu colección de calzado es una maravilla!!! These are wonderful gifts so absolutely amazing shoes. Enjoy. Very dear and gentle Kikka and the collection of shoes is gorgeous! Congratulations Drora on your fabulous gifts! Enjoy. Bonita colección de zapatos, las nuevas pieas son fabulosas. Un regalo estupendo. I hope you enjoy those wonderful gifts! Have a great time! Such lovely gifts from Kikka. Love your shoe collection. What is it about women and shoes? Preciosos regalos, que los disfrutes . Y tu colección de zapatos chulisima. Ma che bei regali! E la tua collezione di scarpe è veramente incantevole!